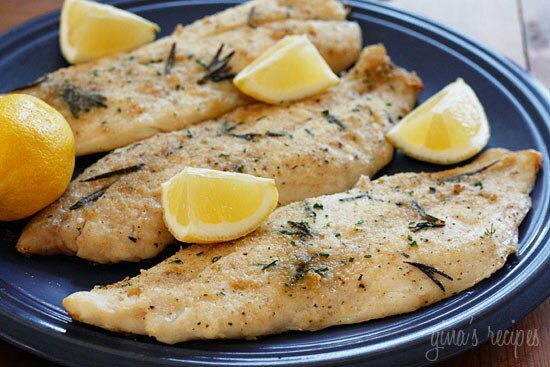 Roasted snapper fillets seasoned with rosemary, garlic and olive oil dusted with breadcrumbs and roasted in the oven or also excellent cooked on the grill. This takes less than 30 minutes to make and we enjoyed this with a cucumber tomato salad on the side. 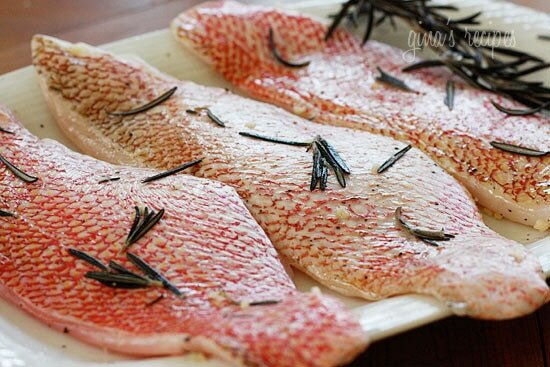 Snapper is a finely textured white fish that lends itself very well to herbs and seasoning. For this recipe I used red snapper because it’s always been a favorite of mine but after cooking this last night I did some research and read that it has been overfished and is on a list for endangered species which probably explains the high price. 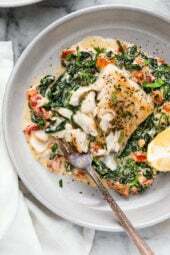 I was crushed since this is a fish I really enjoy and I was hesitant to post the recipe, but then figured this would be a great time to bring up the topic of sustainable seafood, something I first heard of last year while in San Fransisco from Alaskan Seafood. What is sustainable seafood was my first thought after hearing about this? What that means is the fishing is managed for protection against overfishing, habitat damage, and pollution and doesn’t compromise the surrounding ecosystem. As a consumer, you can drive the market for sustainable seafood by choosing fish only from healthy, responsibly-managed sources, and caught or farmed in ways which minimize damage to the marine environment. A practice I will follow moving forward. So, back to the recipe… upon research I found better sustainable alternatives to red snapper such as mutton snapper, rainbow snapper or yellowtail snapper. I will be doing my research next time I buy fish and will ask my fishmonger. I prefer fillets with the skin still on which help keep the fish together while cooking and adds to the flavor. Rinse and dry fish well. Line a broiler rack with aluminum foil. Rub fish with 1 tsp olive oil and season with salt and pepper, garlic and rosemary. 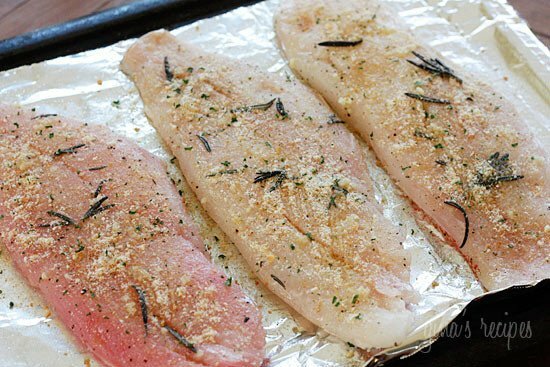 Place skin side down on oven rack and sprinkle bread crumbs on top. Drizzle remaining oil and bake until fish is cooked through, about 15-20 minutes. I was just diagnosed with very high cholesterol (it’s hereditary) and have been preparing most dishes on your site. This snapper dish and your fish sticks recipe were phenomenal! I never thought fish sticks could be so delicious! Thanks, you’re awesome! Hi! This looks AMAZING (I have snapper in the freezer!) Only problem is, my kitchen is being remodeled and my only source of cooking is the charcoal grill and an induction burner. If I grill this, would you recommend I leave off the breadcrumbs? Thank you! Perhaps you can grill on foil to mimick the oven? Excellent! Just the right amount of flavor while not overpowering the fish. I used fresh striped bass and fresh oregano (rather than rosemary), all else was according to the recipe. Would cod, halibut, or tilapia work? I can’t find snapper! Yes, any fish filet would work. Wild fish doesn't always mean sustainable. And farmed fish can be a good alternative. A great resource is the Monterey Bay Aquarium which posts a guide to sustainable fish that they periodically update. I'm not sure where storebought snapper comes from, but I live in Florida and my boss catches it in the Gulf. I do know that there is a limit of 2 snapper per person you are allowed to catch. That said, he has gone out the past couple of weekends and easiliy catches that many and they are big…doesn't seem to be a shortage in these waters! There are other snapper varieties that are not on endangered list that are quite good. I'm going to use this recipe with lane snapper tonight. Sure this would be great with salmon. Would this recipe work with salmon? I have a bunch of wild salmon frozen and am looking for new ways to prepare it, this sounded like it would be good. What do you think? I like using my grill basket for fish, works like a charm! I want to make this on the grill, how do you suggest doing that? This looks delicious! Thanks for talking about sustainable seafood! Nina, good for you! And thanks, I was happy someone made me aware of the issue so I am happy to spread the word. Hope you all do to! Beautiful. It looks so fresh! 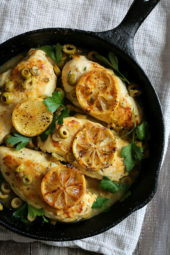 So simple and delicious – this was the perfect Spring dinner. Thank you for the inspiration. Thanks Tasha, 95% complete! You'll know if you don't see points+. Just leave a comment under that recipe and I'll update as soon as I can. Hi. I used to have several of your recipes bookmarked when I did the old WW system. I'm now starting back with the new, and I'm curious. 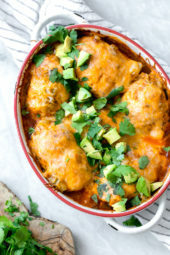 I haven't had time to look through all of the recipes, but have your older recipes (which are some of my faves) been all updated to the New Points+ program? Thanks! Great idea Jennifer, I actually have one from Alaskan Seafood which is all sustainable by the way! I will put it in my wallet. Recently I found a "Seafood Pocket Guide" that I can carry in my wallet. There are a number of them on the web, easily found by Googling. The one I have identifies choices for both sustainability and toxins. Katherine, thanks for mentioning that, I meant to post it. They have a great phone app as well for iphone and droid! I have to admit I can often be terrible at remembering to keep sustainability in mind when buying seafood. It's one of those things where I have no excuse, but sometimes it falls to the back of my mind. I'm especially a fan of the fact that Whole Foods seems to have stepped up their labeling. It's now SO much easier to get all of this info just looking at the fish tag. Thanks for the recipe and the insight. I make it a point to purchase wild caught fish so learning of sustainable seafood gives me a lot to consider with my next purchase. And KUDOS for making eating healthy tremendously enjoyable! The Monterey Aquarium in California has a great website with a "Seafood Watch" with recommendations on sustainable fish. They have a downloadable pocket guide as well. It's http://www.monereyaquarium.org and then click on "Seafood Watch". I think they even have a regional guide. Your recipes are great and very appreciated. This looks so yummy! I have recently started to change up my diet a little and I'm wanting to incorporate more fish into it for the protein values! 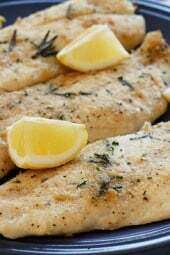 I tried your Baked Lemon and Garlic Tilapia the other day and it was great! Thanks so much!